A bearded Richard Branson (center) gets a congratulatory hug from SpaceShipTwo designer Burt Rutan. Sierra Nevada Corp.'s Mark Sirangelo, who was involved in the development of SpaceShipTwo's hybrid rocket engine, can be seen just to the right of Rutan. British billionaire Richard Branson's Virgin companies operate airplanes and trains, sell music and phones, offer games and radio shows. He's an adventurer who has flown balloons over oceans, has swum with sharks and whales, and has even started up his own ocean exploration venture. He's had his own reality-TV series and played cameo roles in "Around the World in 80 Days," "Casino Royale" and "Superman Returns." But what really gets the 62-year-old's juices flowing is outer space: Even in a Virgin Mobile TV commercial, Branson's dream of going weightless serves as the kicker. So it's debatable whether anyone was happier than Branson to see Monday's first blastoff by SpaceShipTwo, the rocket plane that he hopes will take hundreds of regular people (with $200,000 to spend) on quick suborbital trips into outer space. Over the past eight and a half years, Branson has spent tens of millions of dollars to get his Virgin Galactic venture this far, and if the tests continue to go smoothly, he and his kids may soon be getting on the space plane themselves. Cosmic Log: You've talked about how you and your family are looking forward to this. After today's launch, are you looking forward to it even more? Richard Branson: Of course. It was a thrilling day today. Everything went absolutely according to plan. It looked magnificent. The pilots just loved the experience. I think they were tempted to go straight into space, but knew they'd get fired if they did. We're very much looking forward to getting there either at the end of this year or very early next year. Virgin Galactic's billionaire backer, Richard Branson, gets a "high-ten" hand-slap from SpaceShipTwo pilot Mark Stucky. George Whitesides, Virgin Galactic's CEO and president, is to Branson's right. Q: What has this effort meant to you? I don't know if people could have predicted that it would take eight and a half years to get to this point after SpaceShipOne. Has this been a longer road than you thought it would be? Does that make it taste sweeter when things go right? A: Yes, it's been a very long road. 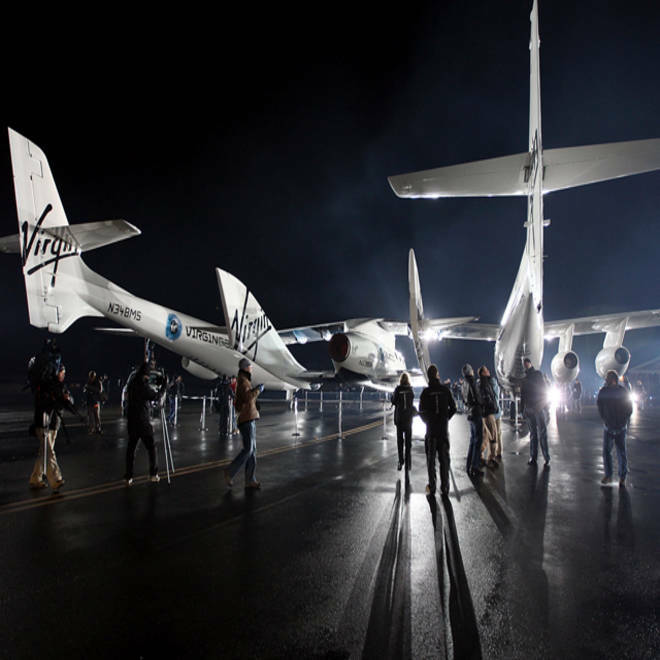 But as far as putting people into space, Virgin Galactic is the only company that has gotten this far. Quite a few other companies have also been working hard to get this far. Today was such an important milestone, in that we knew the rockets were finally working. We knew the spaceship worked on its own. But we obviously needed to test the two together to make sure that the designers got it right. We're absolutely delighted that it broke the sound barrier on its very first flight, and that everything went so smoothly. So we really are on the way now. We've overcome the biggest hurdle, and there are no major hurdles left except for the normal test flights that are needed before we go into space. Q: How many test flights do you think will be needed? You've already mentioned that you are hoping the first spaceflights could happen by the end of this year, and commercial service would follow. Now that the first powered test has taken place, what does the schedule ahead look like? A: There will be many test flights between now and the end of the year, before we actually go into space. We'll do as many tests as we feel are necessary before we actually turn it over to myself, my children and other people. We'll be working with the FAA and others to get as many flights under our belts as we feel are needed, but I do think we'll be ready by the end of the year. Q: When you saw SpaceShipTwo fire up its engine, were there any surprises, or was it totally the way you expected it to go. Did you ever think to yourself, "Whoa, I didn't think it was going to work that way"? A: Fortunately, there were no surprises. Until it happens, you have to be nervous, even though you have the best team in the world working with it. What was incredible was how clear it was, just looking up without binoculars. You could visibly see the spaceship getting faster and faster. There's an old saying, "It's not rocket science." But this is rocket science, and that's why it's taken eight and a half years to get this far. Q: You have more than 500 people who have already put money down for a flight, and many more who are interested in the idea of flying into outer space. What would you say to them about the significance of today's test, and what they can expect in the years ahead? A: Today was the most significant day in the program. I think that for those people who have been good enough to stick with us for the last eight years, who signed up early on, their time to become astronauts is very soon now. I'd just say, 'Thank you very much for sticking with it.' We'll soon be able to make their dreams come true. Commercial Spaceflight Federation: "We are one step closer to achieving safe, routine and cost-effective access to space that will create abundant opportunities for space-based research and that will inspire the next generation of engineers and scientists." House Majority Whip Kevin McCarthy, R-Calif.: SpaceShipTwo's supersonic flight is a "major milestone in commercial space travel, bringing us one step closer to offering private commercial space travel and solidifying the Mojave Air and Space Port as our nation’s premier aerospace research, development and test flight center for this emerging space industry." Spaceport America: "Today's successful powered flight means we are getting closer to the day when the first Virgin Galactic passenger flight will be taking place from Spaceport America in New Mexico." Click through scenes from the construction of Virgin Galactic's suborbital passenger spaceship. Alan Boyle is NBCNews.com's science editor. Connect with the Cosmic Log community by "liking" the log's Facebook page, following @b0yle on Twitter and adding the Cosmic Log page to your Google+ presence. To keep up with Cosmic Log and the rest of NBCNews.com's science and space coverage, sign up for the Tech & Science newsletter, delivered to your email in-box. You can also check out "The Case for Pluto," my book about the controversial dwarf planet and the search for new worlds.